I would play this. I would play this so hard. Fair warning, this post isn’t going to make a lick of sense to you if you’re not a M:tG nerd. If you don’t know what that means, it’s already too late and you should probably read something else. Normally, I look at fan-created Magic: the Gathering cards with a skeptically dismissive eyebrow. They’re usually undercosted or overpowered or unplayable or some ungodly combination of all three. Or they’re mechanically ridiculous or they look atrocious. Take a look at these, however. 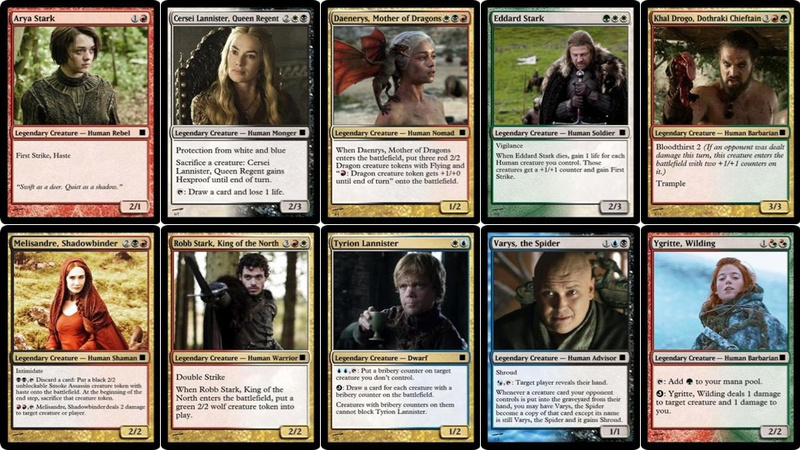 These fan-created Game of Thrones cards look amazing! Not only do I want to play them, but I want to have discussions about them. Do you think Tyrion is White/Blue? Varys as Blue/Black is spot-on and Littlefinger as pure Black makes sense as well. Both Melisandre and Joffrey are Black/Red . . . interesting. Take a look at the article for some larger versions and tell me what you think. Awesome? Horribly nerdy? Some combination of the two? Awesomely nerdy. This makes me somewhat consider trying out M:TG again, but I suspect Hearthstone is going to scratch that itch for me when it comes out, and I won’t have to lay out any money for it. I’d rather see them as art than as the actors. Yeah, any desire I have to get involved in Magic again is quickly crushed by my unwillingness to pay the ridiculous amounts of money necessary to competitively play Magic again. I still have the deck I took to a Pro Tour Qualifier a few years ago (Extended format, before they changed it) and at $250 dollars or so, my deck was probably the cheapest one I saw all day.